Russell Shorto returns to the John Adams to discuss his new book Revolution Song, a work of narrative non-fiction that weaves together the lives of six people for whom the American Revolution took different meaning and weight: George Washington; a British aristocrat and statesman; an African-born slave; a shoemaker who rose to become mayor of his native Albany, New York; a Seneca warrior; and the American-born daughter of a British officer. Their stories are individual expressions of the pursuit of freedom. Shorto hopes his book allows readers into the lived experience of that time. Why have you decided to take on the American Revolution for your new book? What makes it still worth returning to now? I think we’re still fighting the American Revolution. It was really about freedom. My expertise is in Dutch history in the 1600’s — the Dutch Enlightenment which spawned the wider European Enlightenment — and going back that far, 150 years before the American revolution, is when the focus on the individual and freedom began. The American Revolution was just really one clever way of packaging that. It succeeded brilliantly in some ways, but it completely failed in others. Slavery of course was a total lack of success of that project. Women’s rights, too, would come much later. The women’s rights movement, the civil rights movement, the Civil War, all of American history really is continuing this process of unfolding or uncovering the notion of freedom, right up to consumer rights and where we are right now. If you look at what’s still happening, it can be easy to think: My God, we have to fight this stuff all over again. In your prologue, you even refer to Descartes and the importance of challenging “received wisdom”: each individual has the tools needed to be able to know the truth of something. Nowadays, though, we see the perversity of that turning into the refutation of experts and expertise. Is this the downward slide of the Enlightenment? Descartes’ point was focusing on reason, and that means you have to use reason. Daniel Patrick Moynihan said, and is quoted a lot these days, “Everyone is entitled to their own opinion but not their own facts.” And that’s the essence of it. How you employ reason is a continually debated topic, but it does feel like we’re in a new anti-Enlightenment phase. I’ve written six books and I think the primacy of Enlightenment values is one theme that runs through them. Tell us about your approach of interweaving these stories of six individuals. I write narrative history, which is about people, and I thought it would be interesting to see the era of America’s founding from the perspective not just of the men in powdered wigs, but a cross-section of people. So, I spent about two years kind of auditioning people from different backgrounds, whose lives are well documented—because I write nonfiction, so I need to have the material—and I came up with six. It’s not all one neat story, but at the same time, I’ve picked people whose paths do cross here and there. One of the six is George Washington, so there’s one person everybody knows and everybody associates with it. Through him we get the familiar story of the period. But another is a slave whom we follow from West Africa to the Caribbean to New England. His story is parallel to all the others because during the whole period where white Americans are talking about “freedom”, he doesn’t trust that – he’s working on his own freedom project, and eventually buys himself and his family out of slavery. You’ve said that you don’t want to focus on the “meaning” of the American Revolution, but you are focusing on “freedom” as a theme. How did that come to be? To be honest, I chose these people and I got about a third of the way through the book having committed to this notion that this book wasn’t going to be about anything, I was just going to tell their stories – and then, I realized of course a book has to be about something – and it was about freedom. It was already latently there, all I had to do was tease it out a bit to make it apparent. Take, for example, Margaret Moncrieffe Coghlan. It would be an anachronism to talk about a women’s movement, but the cutting edge of it, at that moment in the 1770’s, was forced marriage. People were writing plays and articles saying that a woman should not be forced to marry against her will. And that’s exactly what happened to her in the middle of the Revolution in New York City: her father, a British officer, forced her to marry another British officer, whom she hated. At that same moment in New York, a play on this topic was taking place, which she probably saw since her father was on the board of the theatre, and she seems to have taken that to heart, and decided this was the time to assert herself. She eventually left this man, whom her father had forced her to marry, in this dramatic fashion. From our perspective, we would say she was trying to live as an independent woman, which was really an impossibility at that time, so her life ultimately becomes a tragedy. From her story, we can see this very broad notion of freedom as it applied – or in fact did not apply – to women at the time. It’s far from the battlefields of the American Revolution, but in a large sense it’s the same issues being played out. She’s your only female character – is there a reason for that? That’s probably my one biggest regret in the book. I intended to have at least two, and then Abraham Yates kind of forced his way in, because he becomes a representative of the ordinary workers and then becomes a vehement anti-federalist. This was an unscientific process. For example, I was really interested in Molly Grant, who the sister of Joseph Grant, a prominent Iroquois leader, and the consort of William Johnson, so she really straddled the lives of the whites and the Iroquois. But I wanted people’s lives who were well documented, and for her there’s a couple periods where her life is well documented, and then other periods where we know nothing for decades. In the preface, you highlight the question: What do freedom of speech and of the press mean when disinformation can be so easily spread? Did you find any satisfaction while researching that question? Most of the time I was writing the book, Trump hadn’t happened. For the last year, when all of this came about, I was mostly done and was in the production process, and I had been knee-deep in all of these documents relating to the founding. And it suddenly seemed so terribly relevant, and not that long ago. We are totally connected to that time. Going back earlier than the period of the Revolution, there’s the John Peter Zenger trial, over freedom of the press in New York. That’s such a watershed, and that was then upheld through the whole period of the French and Indian war, and throughout the whole Revolution onward. It was continually tested, but the principle was strong throughout that era. And to have that suddenly under threat from the White House? It gives you a sense of how historically dangerous these times are. 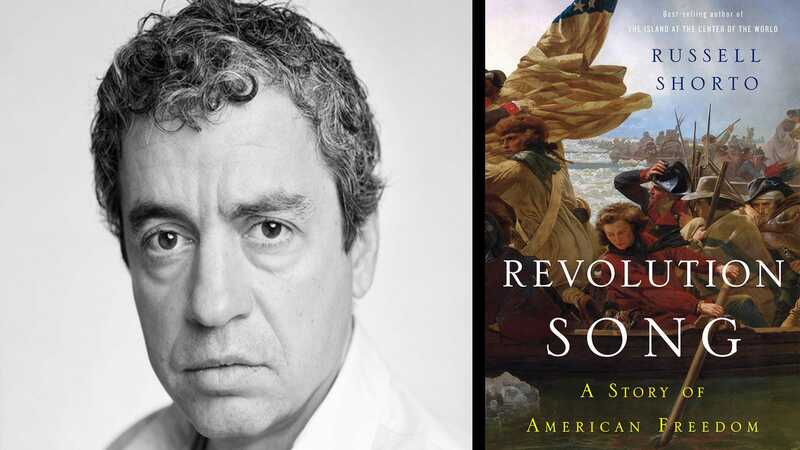 Russell Shorto will be speaking about his new book Revolution Song on January 23, 2018, 8:00 pm – 9:30 pm, at Aula UvA, Singel 411 Amsterdam.